1. 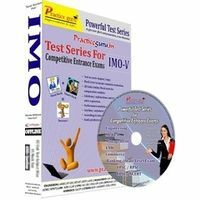 Free online personal online Olympiad exam hall where many practices tests are assigned so that the child can confidently take Global Online Weekly science Olympiad test (GLOWSOT) and Global online weekly Math Olympiad test (GLOWMOT) series. 2. 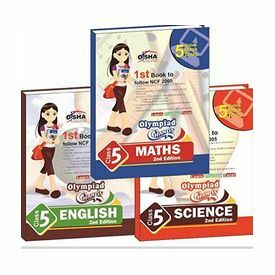 Set of 3 books: Olympiad Champs Science, Mathematics & English Class 5 is the first of its kind book on Olympiad in many ways. The book is aimed at achieving not only success but deep rooted learning in children. The book is prepared on content based on National Curriculum Framework prescribed by NCERT. All the text books, syllabi and teaching practices within the education programme in India must follow NCF. Hence, Olympiad Champs become an ideal book not only for the Olympiad Exams but also for strengthening the concepts. There is an exhaustive range of thought provoking questions in MCQ format to test the student’s knowledge thoroughly. The questions are designed so as to test the knowledge, comprehension, evaluation, analytical and application skills. Solutions and explanations are provided for all questions. The questions are divided into two levels-Challenge A and Challenge B. The first level, Challenge A, is the beginner’s level which comprises of questions like fillers, analogy and odd one out. When the child covers level A, it means his basic knowledge about the subject is clear and now it is ready for challenge B. The second level is the advanced level. Challenge B comprises of techniques like matching, chronological sequencing, picture, passage and feature based, statement correct/ incorrect, integer based, puzzle, grid based, crossword, Venn diagram, table/ chart based and much more. The first concern which each parent faces is how to make their children read a book especially when it is based on academics. Keeping this in mind interesting facts, real life examples, historical preview and short cut to problem solving, charts, diagrams, illustrations and poems are added. In addition to this the book contains comic strip which increases the readability quotient and make the reading experience for the children more exciting. 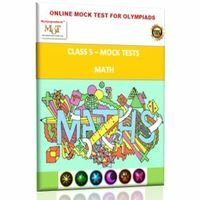 The book also includes a CD containing 15 Online Mock Olympiad Tests (5 of Science, 5 of English and 5 of Mathematics) designed on the pattern of various prominent national Olympiad exams conducted across the various schools in India. With the vision to remove all the misconception a child may have pertaining to the subject, relate his knowledge to the real world and to develop a deeper understanding of the subject this book will cater all the requirements of the students who are going to appear in Olympiads.